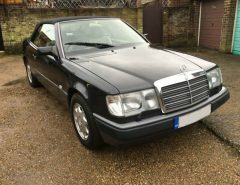 Here are some pictures of my old W124 230 coupe which I thoroughly enjoyed, however it was the bodywork wasnt great with various rust and I wanted a six cylinder W124. I bought the latest W124 300CE from a friend at a price that I couldn’t resist. It was in a “Barn Find” state, with mould all over the interior and obviously a non-runner. The mileage on the car is 26K, however there is no history apart from the MOTs but the bodywork and underneath is solid. First thing to do was to get the car running and of course the dreaded OVP (Over Protection Relay) played a roll, along with the fuel distributor unit. After replacing those parts, it runs great, apart from a differential whine and juddering in reverse, but after a big service I’m hoping this will clear, fingers crossed. I’m a huge fan of old school mercedes black interior, so the old 230CE interior was removed and placed into the 300CE. Evidently not a straight swap due to the cream leather being electric and black manual! Next was the hunt for Genuine AMG bodykit parts, which I sourced from forums and eBay. 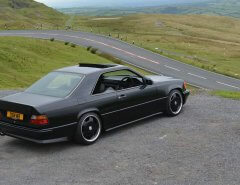 The prices for a complete AMG W124 Body Kit were silly, but buying separately saved quite a bit! Now the majority of the parts have been sourced, the car was serviced, which included Diff – Engine and Auto Oil Change, Filter & Auto Gasket Change and all new spark plugs. Co-Founder & Director of Mercedes Enthusiasts. 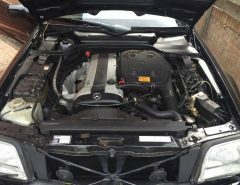 Current Mercedes: W124 300CE AMG, R129 30024V SL, W210 E55 AMG & W210 E320 CDI.